While there are no major economic reports in the UK, GBPUSD will be under the influence of global macroeconomic news. The support rests at 1.28220 with resistance at 1.28870 which the weekly pivot point at 1.28380 is located in between the lines. The EMA of 10 is moving horizontally in the ascendant channel and it is below the EMA of 200 and above the EMA of 100. The RSI is moving on the 50 level, the Stochastic is moving in low ranges and the MACD line is below the signal line in the negative territory. The ADX is showing weak sell signal. 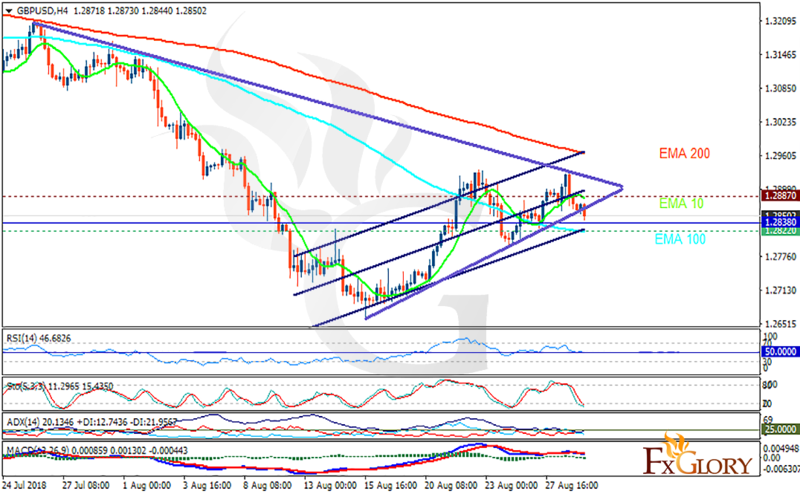 The chart has created a rising wedge therefore there is a high chance that the price falls towards 1.2750.